High Pressure Technologies provides Morgan’s Pneumatic Chemical Metering Pumps which are widely used in the oil & gas industry. 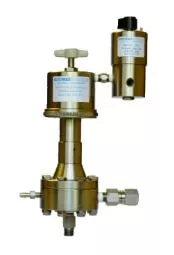 High pressure chemical injection pumps are used to inject chemicals such as corrosion inhibitors, defoamer or anti-foamers, detergents, methanol, and emulsifiers or de-emulsifiers into your pipeline for the specific application. Where your application is keeping a pipeline flowing, improving well production or neutralizing corrosive substances you need a high quality, reliable chemical metering pump. Each type of chemical injection pump comprises intricate features that are designed to provide specific benefits to the customer and his application. Morgan’s pneumatic metering chemical injection pumps are economical performers. Morgan builds precision pumps with vast applications in oil, gas and water treatments. Over 20 years of experience supports the design and manufacture of pumps that, on occasion, have raised the entire industry’s standards. Morgan chemical injection pumps for oil and gas are designed for lasting performance and easy maintenance. The quality of Morgan products is continually acclaimed in the field for accurate performance, minimal maintenance and long life. High Pressure Technologies also provides complete Chemical Injection Skids. The pump housing is constructed from stainless steel, making it extremely reliable in corrosive environments. A Teflon-laminated diaphragm along with the stainless steel construction provides enhanced product durability. The pump’s design eliminates unbalanced pressure that can lead to diaphragm failure. Fluid rate and volume can be adjusted while the pump in is operation. Stainless steel base allows for secure pump installation. The plunger and seal can be easily accessed due to a hand tightened lock ring. A combination coating of Teflon and Inconel is applied to the spring to ensure a longer service life. The plunger is independent of the air piston, allowing for separate replacement, which reduces maintenance costs. Morgan uses a computer-driven manufacturing process that guarantees the precision of pump dimensions resulting in accurate, trouble-free performance. Morgan Products has one of the widest selection of pump applications and sizes, making it easier to meet individual job specifications. Performance ranges of individual pumps exceed many industry standards. For example, supply pressure range from 25 to 150 psi with a single Morgan timer and output pulses are 0 to 50 strokes per minute (SPM). Every Morgan Product is tested to ensure performance accuracy before shipment. Morgan pumps are designed for lasting performance and easy maintenance. Their stainless steel construction is highly resistant to corrosive elements and is especially recommended for offshore drilling applications. Lighter weight, fewer parts, and easy assembly reduce maintenance costs and improve durability. Morgan Products are competitively priced for outstanding savings on your initial investment. Additional savings result from long service life and low maintenance.